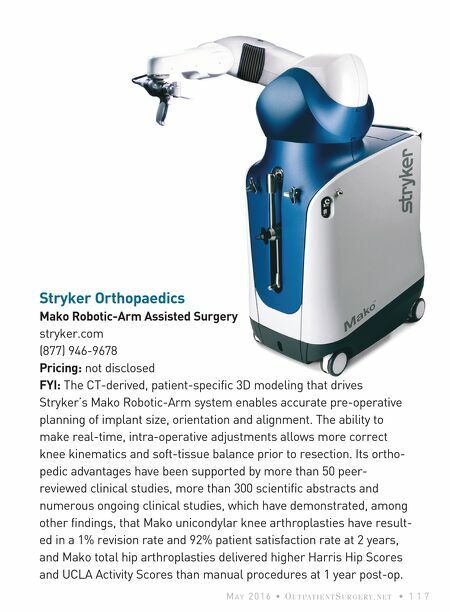 M A Y 2 0 1 6 • O U T PA T I E N TS U R G E R Y. N E T • 1 1 7 Stryker Orthopaedics Mako Robotic-Arm Assisted Surgery stryker.com (877) 946-9678 Pricing: not disclosed FYI: The CT-derived, patient-specific 3D modeling that drives Stryker's Mako Robotic-Arm system enables accurate pre-operative planning of implant size, orientation and alignment. 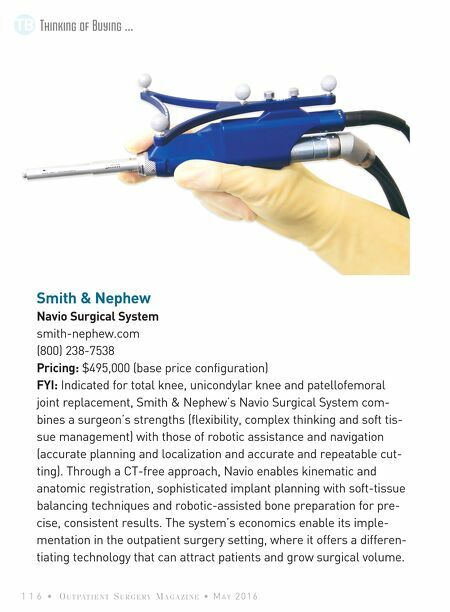 The ability to make real-time, intra-operative adjustments allows more correct knee kinematics and soft-tissue balance prior to resection. Its ortho- pedic advantages have been supported by more than 50 peer- reviewed clinical studies, more than 300 scientific abstracts and numerous ongoing clinical studies, which have demonstrated, among other findings, that Mako unicondylar knee arthroplasties have result- ed in a 1% revision rate and 92% patient satisfaction rate at 2 years, and Mako total hip arthroplasties delivered higher Harris Hip Scores and UCLA Activity Scores than manual procedures at 1 year post-op.